HILLION RESIDENCES is located at 8 - 12 JELEBU ROAD in district 23 (Bukit Batok, Choa Chu Kang) of Singapore. 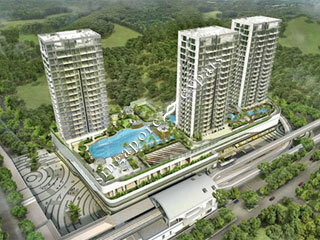 HILLION RESIDENCES is a 99-year Leasehold Condo development consisting of 546 units. HILLION RESIDENCES is completed / TOP in 2016 (estimated), developed by SIM LIAN JV (BP RETAIL) PTE LTD.
Educational institutions like ST. FRANCIS METHODIST SCHOOL, GERMAN EUROPEAN SCHOOL SINGAPORE, HOLLANDSE SCHOOL, WEST VIEW PRIMARY SCHOOL, ZHENGHUA PRIMARY SCHOOL and DE LA SALLE SCHOOL are near to HILLION RESIDENCES. HILLION RESIDENCES is accessible via nearby BUKIT PANJANG, CASHEW and HILLVIEW MRT Stations.